In the third of a series of posts on the Impact of LSE Blogs project, Carlos Arrebola takes a closer look at the increasing frequency with which LSE blog posts are being cited in scholarly publications. The Impact Blog has been cited most often, perhaps reflecting its authors’ readiness to draw on non-traditional scholarly outputs. Unsurprisingly, a majority of citations come from English-speaking countries and in social sciences subjects. Meanwhile, some posts are even cited where there is a corresponding journal article available; either because supplementary detail may be provided, or because of wider access issues. In a recent study analysing how scientists use Twitter, blogs.lse.ac.uk ranked amongst the domains most shared by scientists, and as the single most shared amongst political scientists. It places LSE blogs alongside the likes of Nature, Scientific American or PLOS One, and web platforms of publishers such as Wiley or Springer. This study highlights the importance of LSE blogs as a publication outlet for researchers. Thus, it was not surprising to find during the course of our project that LSE blog posts are regularly cited by academics. Following a study by Kousha and Thelwall that looked at how BBC news articles are cited, we looked at the Scopus database (accessed in June 2017) and observed that more than 800 journal articles or books have cited LSE blog posts as a source, with the number of citations to LSE blogs growing each year. As the readership figures of the blogs increase (having accrued more than 7 million views in 2016), so too does the use of our posts as sources. This upward trend is visible in Figure 1, compiled using data from Scopus and Google Analytics. The use of LSE blog posts as sources reflects a further element of impact on the academic sphere of our blogs, as new types of academic publications that appear to sit alongside traditional journal articles and books. The figures from Scopus show that scholars use LSE blogs not only as a provider of quality research summaries (as we showed in our previous post in this series) but also as sources on their own merit. After all, while not peer reviewed in the same way as most journal publications, each LSE blog is overseen by a dedicated editor or editors, with contributions carefully selected, revised, and improved. Many of our posts discuss and develop ideas and research not necessarily published via a more traditional route. The blogs also allow for faster publication, meaning more timely investigations and discussion of current events can be published as they unfold, whilst maintaining a high level of quality. Which LSE blogs are most cited? Looking at the figures for the different LSE blogs, we found the LSE Impact Blog, with more than 200 citations, was the most cited, followed by the LSE British Politics and Policy (BPP) and LSE European Politics and Policy (EUROPP) blogs. Moreover, using the Webometric Analyst software made available by the Statistical Cybermetrics Research Group at Wolverhampton University, we were able to collect a list of the URLs of those posts cited (this software is the same as applied by Kousha and Thelwall in their BBC news study). Ordering the list of URLs alphabetically, we could also see that several specific posts have been repeatedly cited. Most of those posts that have accumulated several citations were indeed from the Impact Blog. For example, Jason Priem’s 2011 post, analysing how academics use Twitter, has been cited six times by different authors. As the BPP and EUROPP blogs have readerships of comparable size to that of the Impact Blog, one might expect a similar number of citations to these blogs. It may be, however, that there are different patterns of citation within different subjects, some of which might be more inclined to incorporate new forms of scholarly publications into their work. This could mean that scholars who work on topics within the purview of the Impact Blog have fewer reservations about using blog posts as sources in the same way as they would journal articles. Indeed, Dr Niall Cunningham, from the Department of Geography at Durham University, acknowledges this possibility. He works across several disciplines and observes these differences: “I work in more traditional historical geography and it would not be so common there. But, within human geography more generally it is probably more common [to cite blogs]”. 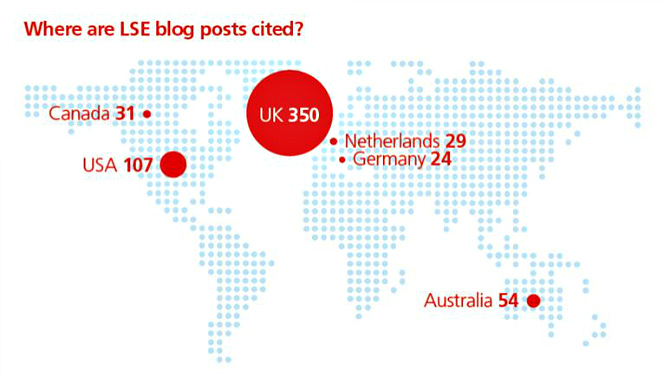 LSE blogs are more cited amongst English-speaking countries, notably the UK, followed by the US, Australia, and Canada. Within the UK, scholars to cite LSE blogs come from a number of different institutions. Unsurprisingly, LSE academics are the ones to have cited LSE blog posts the most, followed by Oxford, Sheffield, Manchester, Bristol, and UCL. Beyond English-speaking countries, the Netherlands and Germany are amongst those countries in which LSE blogs are most cited. In terms of subject areas, more than 80% of articles or books citing LSE blogs are, similarly unsurprisingly, from the social sciences (the information in this paragraph comes from the Scopus database as of April 2017). Also worth mentioning is that those academics to regularly cite LSE blogs are not necessarily regular readers of the blogs. Several of the academics interviewed identified themselves as only “sporadic readers” of the blogs, with most confessing that posts are brought to their attention via Twitter or word of mouth. Moreover, not all of them are contributors of the LSE blogs. Why are LSE blogs cited? Reasons vary as to why academics may cite our blogs. Although most of our interviewees did not believe blog posts to be a substitute for journal articles, they did recognise their alternative added value. For example, Dr Richard Watermeyer, an expert on impact in higher education based at the University of Bath, suggested “blog posts can be treated as good pieces of evidence, but they have to be appropriately contextualised”, as the “robustness” of the peer-review process is not present for blogs, unless they are reporting already published research. However, Dr Watermeyer also recognised that in this source contextualisation exercise some outlets, such as LSE blogs, rank higher as a reputable source, with contributions coming from well-regarded academics. Therefore, as an alternative to a peer-reviewed journal article, in order to draw the attention to a particular piece of evidence academics seem to consider LSE blogs a reputable source from which to draw and develop their arguments. For Dr Katherine Smith of the University of Edinburgh, blog posts can be placed somewhere “in between an academic piece and a mass-media piece”. However, some interviews showed academics may also cite LSE blog posts even where there is a journal article available to cite. This may be for a number of reasons; for example, Dr Tim Oliver of LSE acknowledges that he cites his own LSE blog posts because he has written them as “glorified footnotes”, in which he is able to expand beyond the original published study. Consequently, citing the post may sometimes be more relevant. Another reason may be that the LSE blog post is more accessible than the original study. The academic publishing process can be frustratingly slow, so a blog post explaining that research can make it available far in advance. For example, Dr Niall Cunningham explained how he “was waiting for the findings of a big project to come out [which] was coming through the standard means of publication quite slowly, and [the LSE blog] was the only way of accessing it”. 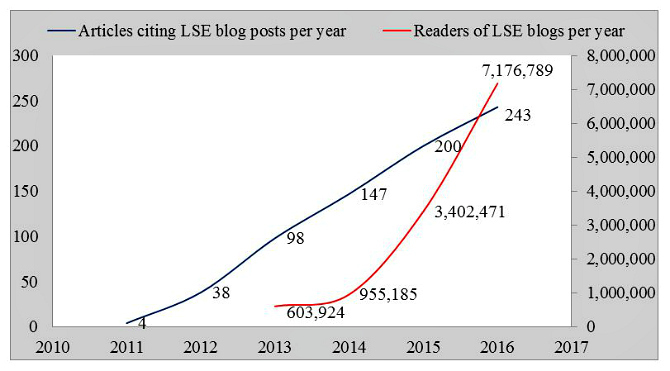 In conclusion, it appears that LSE blogs, in the seven years since their establishment, have found a place as an academic publishing outlet, not necessarily as a substitute for traditional publishing houses, but as a new form of publishing that is quicker, allows for coverage of more topical content, reaches an audience beyond the more specialist readership of journal articles, and is still regarded as a reputable source that carefully screens and edits its contributions. For these reasons, LSE blogs have an academic impact as outlets for evidence-based research, able to be shared and cited. As LSE blog posts are also searchable in Google Scholar, it seems appropriate to end this post by saying that to cite LSE blog posts is to “stand on the shoulders of giants”. Carlos Arrebola is Research and Blog Impact Officer for the Impact of LSE Blogs project, exploring the impact that LSE Blogs have on the academic community. He is also a research student at the University of Cambridge, where his work focuses on European Union and Competition law. Prior to that, he studied Law and Economics at Universidad Carlos III de Madrid. He sometimes tweets as @carrebola.